Regiment/Catrawd: 16th Battalion, Welsh Regiment. Service Rank and Number / Rheng gwasanaeth a rhif: Lieutenant. Military Cemetery/Memorial / Fynwent milwrol: Curragh Military Cemetery, County Kildare. Ref No Grave or Memorial / Rhif cyfeirnod bedd: 1264. Country of Cemetery or Memorial / Gwlad y fynwent neu gofeb: Ireland. 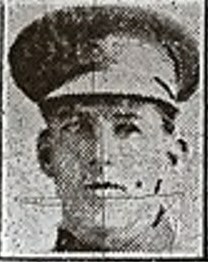 Killed in a Bomb Training Accident at Curragh, Ireland aged 27 years. Edward Shurey was born in Ystrad, Glamorgan, Wales on 16 September 1891. The 1911 Census shows that the family lived at 17 William Street, Ystrad, Glamorgan. The head of the family was Harry Shurey aged 42, a Coal Miner. His wife Charlotte Shurey aged 41 and their four children – Edward Shurey aged 19, a Coal Miner, Harry Shurey aged 17, a Coal Miner, Herbert Shurey aged 4 and Ivy Shurey aged 8 months. Edward at some stage left the Coal Mine and became Police Constable 616, stationed at Whitchurch Police Station, Cardiff, Wales. He married Florence Mary and they lived in Rhyl, Flintshire, North Wales. He enlisted with 16th Battalion, Welsh Regiment. He was later promoted to Sergeant and served in France, where he was commissioned as a 2nd Lieutenant on Saturday 4 December 1915. He was wounded in France and following recuperation was posted to a training unit in Ireland, where he was killed in a bomb training accident. On 18 July 1918, a payment of £167. 4s. 5d. was made by the War Office to Florence Mary Shurey, being monies owed to her husband Edward. On 6 November 1919, a further payment which is recorded as a War Gratuity of £8. 0s. 0d. was also made to her. He is also remembered on a Remembrance Plaque at The Royal Alexandra Hospital, Marine Drive, Rhyl, Flintshire, on The North Wales Heroes Memorial Arch, Deiniol Road, Bangor, North Wales. and on the Glamorgan Constabulary War Memorial.